It took me a while to write this mostly because work is insane as hell and I never have free time. In November I moved from Philly to Orlando, my permanent residence was still in Vermont while I consulted for a year in the philly area. After the move was completed I needed to bring my car down, I had some vacation time, and so did one of my best friends. I had a great Idea, lets spend 4 days with each other driving over every back mountain road we could find! It didn’t take a lot of convincing for Drew to agree to make the trip with me. The first leg of the trip was the most boring, Mostly highways. We drove from Burlington VT to Chantilly VA, and spent the night in a Marriott I had been accustom to while doing business in the DC area. It was sad leaving Vermont, I was raised there and didn’t really know much besides it. That said, at least I was leaving with two great friends, Drew and my 2015 Pure red BRZ. It was basically in stock form, I had ST coilovers with a performance alignment, dropped about an inch over stock, track pipe to give it some grumble, and tinted windows. So not much but enough to enhance the handling and make it wail through the mountains. After a goods nights rest, Drew and I awoke to a quintessential November day, it was clear and crisp, blue skies were overshadowed by a heavy frost making the grass look like millions tiny glass sculptures. My first concern was ice and cold tires in the mountains. But that didn’t stop us, we were up early and out of the hotel for 7:00am in hopes to miss the foliage traffic on Skyline drive. Unfortunately it didn’t quite happen like that, I guess all the tourists were awake even before we were. I was hoping that it would be 109 miles of nothing but driving nirvana, but it was more like 109 miles of 15mph behind cars from all over the United States. The first couple miles I was aggravated to say the least, up until the first major opening in the foliage revealed its beautiful sea of orange and yellow leaves. I feel the word awesome is quite overused for things that are just typically normal. From the summits of these mountains, this is not the typical, truly an awe inspiring moment to see small towns sitting in the valleys as you look down upon them from 4000 ft above sea level and larger mountains towering over your perch. The drive is nice, roads are quality and well paved. It did take about 6 hours to travel the full 109 miles and that was with a couple stops to check out the sights. Also as a disclaimer, if you plan on driving this road there is a $20 toll. Not long after you exit Skyline, you wind your way through some back wood roads and end up at the start of the Blue Ridge Parkways. Have you ever felt that you know something is special? I had this feeling as we embarked across the entrance to a 469 mile journey across the mountaintops of VA and NC. We talked with a couple on a Harley while taking this photo and they told us that to do the blue ridge right, they would have liked at least a week on the road. As we sat there looking at the sign from the inside of the BRZ, I blipped the throttle and with a decent amount of wheel spin we were off. We pushed through some of the greatest driving I’ve ever seen over the next couple hundred miles. Making random stops to look at some of the best views you can find in the United States. 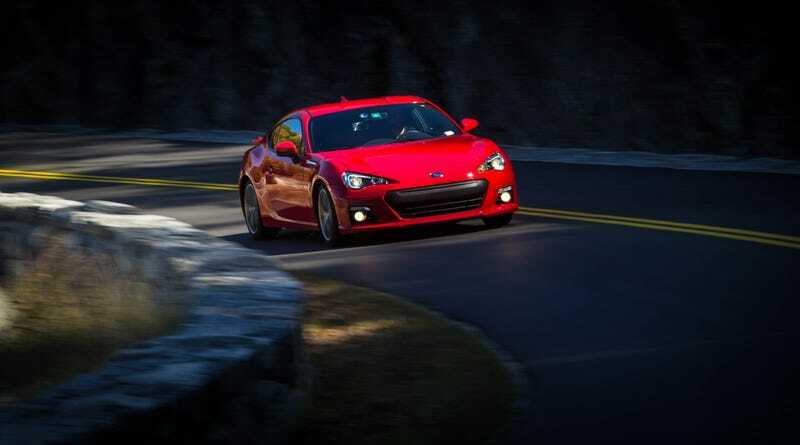 This was a great way to break in the BRZ and really find out what this car is made of. Though it doesn’t have the power everyone craves for, it doesn’t mean that its slow by any means. Ripping through the mountains, we were still encountering cars going 30 in a 45. Its memorable, dropping down into second with the RPMS climbing and the reverberation of the exhaust screaming off the shear rock faces as we overpassed vehicles. I would say the majority of the trip I didn’t feel the BRZ was underpowered, quick but not fast. We found a campground, November in the mountains isn’t what I would call warm, so the campground was deserted. I thought it was a great opportunity to break out the camera and catch some stars. After some serious fails, (my first time doing stars) I was able to get a couple good shots and we were back on the road and had cell reception! We found a fairfield inn in Elkin NC to pull off before we totaled the car because of the deer issue.